2011 represents the fourth year that we have been tracking foreclosures in Tallahassee, so we have some history in which to compare 2011 foreclosures and we can identify some key trends. 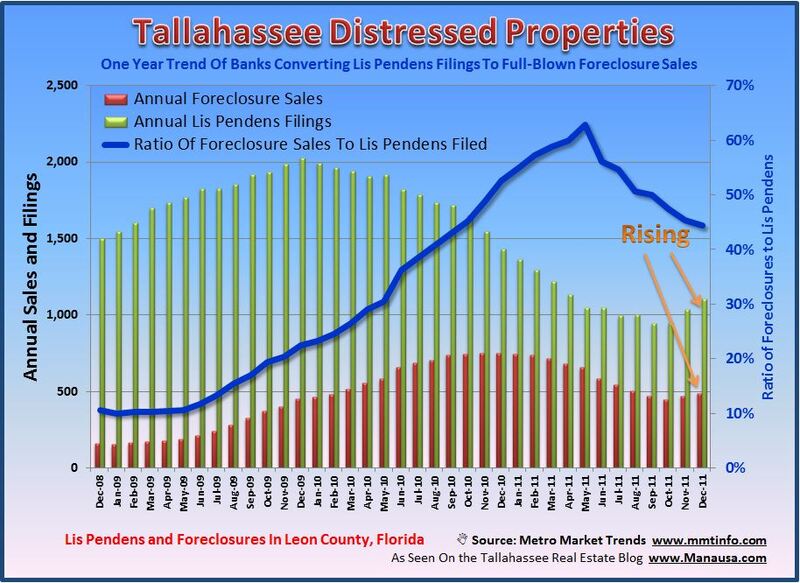 This report contains a list of all Tallahassee foreclosures that were filed (lis pendens) in 2011 and has some interesting foreclosure graphs. During 2011, there were 1,104 lis pendens filed and 489 foreclosure sales. The current ratio of foreclosure sales to lis pendens filings is roughly 45% , which is roughly three times higher than our historical norm of initial filings that actually culminate in a foreclosure sale. Overall, the positive trend of 2010 was replaced with a negative trend in 2011. While new lis pendens filings (the start of new foreclosures) were down 23% in 2011 over 2010, and was even lower than 2009, but the end of the year saw a reversal for four of the last five months. This accelerating trend most likely means we should see a rise in the inventory of distressed properties and this means that values will continue to decline in 2012. It is no surprise that our Tallahassee Short Sales page is so active. But with the slew of distressed properties in Tallahassee, in conjunction with rising lis pendens filings, this conversion ratio is far higher than historically normal at 45% as we close out the 2011 calendar year. With fewer and fewer homeowners able to work out their problems, banks will have to soften their stance on short sales, or the foreclosure conversion ratio will continue to remain very high. 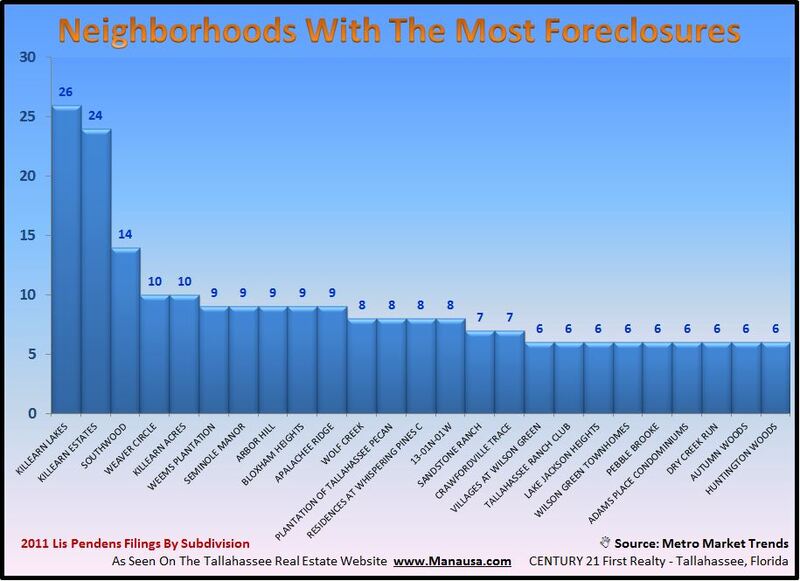 The following graph and table show the Tallahassee Subdivisions that were hit the hardest with lis pendens filings in 2011. This is a good indication where we will see the most short sales, foreclosure sales, and REO property opportunities in Tallahassee in 2012 and 2013.